While living out her first dream as touring sound engineer she saw a need to implement a healthier, and more grounding environment on tour, so she created her Joyology to keep artists happy, healthy, and inspired in body and mind while on grueling tours. She now works with everyone from Grammy Award winning artists to stay at home moms, worldwide, to implement a healthier lifestyle, cultivate a greater self love and keep them in integrity with who they want to be in the world. In this week’s new episode we chat about Tricia’s journey, the moment that woke her up, and how she became the joyologist. We have a really great conversation about what it means to own your awesome, honoring and acknowledging the space we’re in, and how by pushing beyond what’s comfortable we can begin to believe in what’s possible. Plus, Tricia shares why we need to remove the word “should” from our vocabulary, choosing affirmations, and how you too can become a Joyologist. In this week’s new episode Tricia walks us through her journey becoming a joyologist. I really loved hearing about her her journey and I know you guys are going to find it to be just as inspiring as I did. Tricia has always followed her passions, her joy, and the vision she has for her life. We often don’t know where our journey is going to take us, but we always seem to land exactly where we’re meant to. Growing up Tricia suffered from a ton of medical problems, and living with pain had a huge effect on her. The truth is she was in so much physical pain that she couldn’t bear to have any mental stress. During those years of struggle, she often felt very alone, especially in high school. She had a loving, supportive family and loads of friends, but no one really understood what she was living with. In this week’s episode she shares that she had some pretty low moments and at her ultimate low (when she was 15) she turned herself around. She told herself that if she was going to keep on living this life she was doing it for herself. She told herself that she loved herself, and that it didn’t matter if no one else did and from that moment on that’s what she did. She loved herself and lived her life for her. She didn’t let anyone else’s disempowering thoughts get her down, she didn’t play into gossip or what was “cool,” instead she listened to herself and believed in herself. Growing up, Tricia was obsessed with music, especially, live music. Cincinnati wasn’t exactly a music but, but she would go with anyone to see any concert no matter the genre. When college time came around, she only applied for one school, Columbia College Chicago, for their music business program. She knew nothing about the business and played no instruments, but she just knew that she wanted in and that she was most drawn to live music. Tricia worked her way into the man’s world of live sound and quickly become a leader in her industry. She was one of the only women, and by asking a lot of questions, following her heart, and having a hunger to learn - Tricia went from selling T-shirts at the House of Blues to running the show on tour for pretty much every big-name artist. When she was first getting started she made friends with with the production team and asked if she could come see what they did, explaining that she wanted more than anything to be a part of that world. Immediately after, she quit her good paying office job to work 40+ hours for free in the production world (while still working in the company store and attending college full-time). She completely immersed herself in learning everything that she could. Oh and did I mention this all started at the age of 19 (just 6 months after moving to Chicago!?) That’s when she discovered that her college actually had a Sound Major and even a live sound division, so she switched all of her classes out one week before the next semester started and never looked back. Tricia was successful, well-loved, and had created both a thriving career and community. She was living her dream, and loving it. But then - she received an unexpected call that changed her life and her perspective: her father suddenly passed away. Work was her life and her life was her work, and after six weeks of touring without a day off and a full year on the road ahead of her - she stepped away from the tour and allowed herself the time to grieve. Her intention was to keep the tour healthy on the inside and on the outside. She energized the tour by vining out the dressing rooms, posting positive affirmations and quotes, leading yoga sessions, preparing energizing and healthy meals, and most importantly being the loving, grounding energy on the tour that is always available for listening and for calling the artist out on their BS. 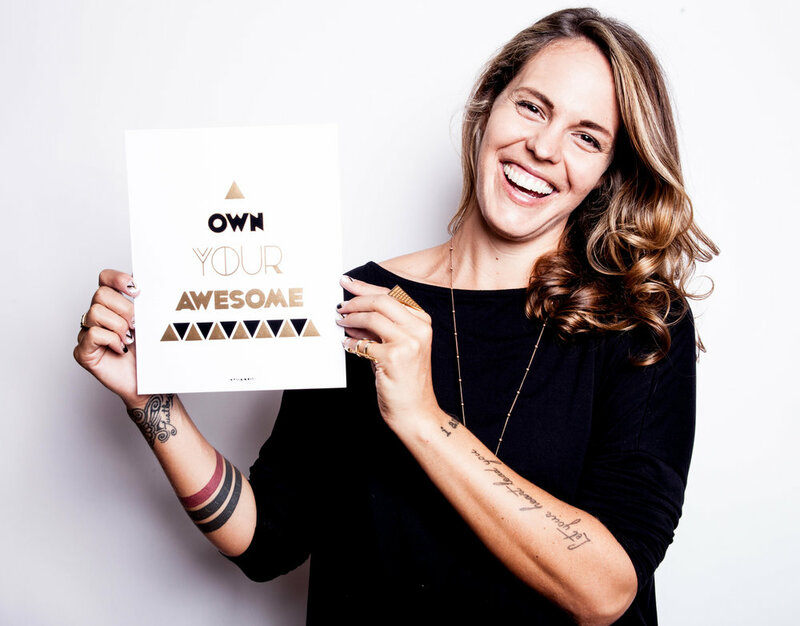 Now, Tricia coaches both one-on-one and in groups, she’s the creative badass behind her product line your Joyologist, and she even recently launched an app called Own your Awesome. The screenshot from our conversation - I mean, come on!? How perfect is this!! You’re going to love Tricia’s words on what it means to honor and acknowledge the space we’re in, but at the same time push beyond what’s comfortable. For me, what’s comfortable is usually the “negative” outcome, and it’s been a journey to become more comfortable with the notion that things could actually work out! That positive outcome could really be my reality! Can anyone else relate to this? Tricia cut the word “should” out of her vocabulary years ago, and it’s been transformative and a total game changer for her. Instead of focusing on what she “should do” or what she “needs to do”, cutting the shoulds out of her life has allowed her to focus on what she wants to do. Like I said, GAME CHANGER. This conversation is one of my favorites to date. We really dig deep about what it means to own your awesome. When we allow ourselves to shine brighter, to believe in ourselves and what we’re capable of, we show others that they too can do the same. The screenshot from our conversation - I mean, how perfect is this?! To learn more and connect with Tricia visit her website www.yourjoyologist.com and connect with Tricia on Instagram @yourjoyologist and @beingtricia and you can find her app, Own Your Awesome, in the App Store! THE POWER OF STORYTELLING: The next episode in our series, The Power of Storytelling, airs on December 18th! We want you to be part of it! To learn more and to submit your story, visit the Share Your Story section of our website. Fill out our interest form - and we'll get back to you ASAP.